A photograph of bridges 13 & 14 on the Welland Ship Canal (Fourth) looking north, Welland, Ontario. April 1930. With the construction of the Welland Canal By-Pass, the bridges are no longer open to ship traffic. 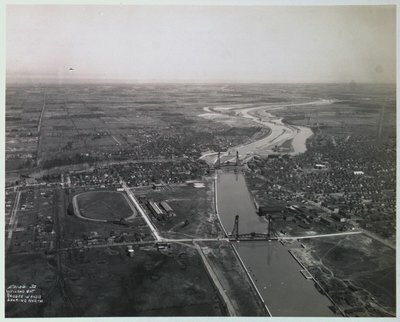 The image is part of a scrapbook containing aerial photographs of the Welland Ship Canal (fourth) from Port Weller to Port Colborne.